Ashdown’s successes as a relatable man, a tactician and a statesman should not blind us to his strategic failures. 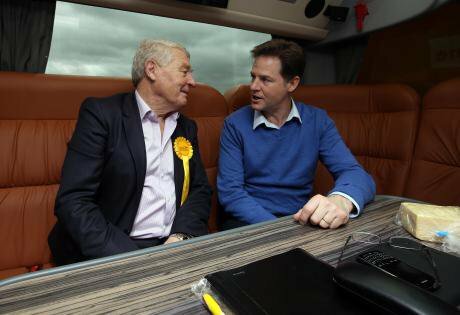 Image: Paddy Ashdown, who died on 22nd December 2018, pictured with then Liberal Democrat leader Nick Clegg during the 2015 election campaign. Credit: Steve Parsons/PA Images, all rights reserved. Paddy Ashdown, who died on 22nd December 2018 aged 77, was in the eyes of many the most successful Liberal leader of our times. That may be true, but he was also more responsible than anyone else for the current demise of the Liberal Democrats as a significant third force in British politics and this, too, should be remembered. What follows is an honest reflection on his contribution to public life by a colleague-in-arms. It looks back on a lifetime of effort that ended in frustration which demands frankness rather than eulogy or self-congratulation. His background made him a relatable, regular person with exceptionally high energy. Born in India, he returned after World War Two to his parents’ homeland in Northern Ireland where he was raised, acquiring an Ulster accent and hence the nickname “Paddy”, before boarding at a minor public school in Bedford. Indifferent ‘A’ Levels and a decline in his family’s fortunes prompted him to enlist as an officer cadet in the Royal Marines and on being commissioned he received the Sword of Honour for being top recruit. He served for thirteen years mainly in the Far East with the Special Boat Service, where he learnt Mandarin, and in Belfast during the Troubles. He retired from the Marines in 1972, having been denied further promotion and joined the FCO, acting in military intelligence while stationed in Geneva. However, career advancement was not offered here either, so he moved to Yeovil with his young family where he held an assortment of unprepossessing jobs in commerce. He joined the Liberal Party, became locally very active, and was selected to fight the General Election in 1979. Losing heavily to the Tory incumbent, he nevertheless managed to come second overtaking Labour. He was re-adopted to fight Yeovil again. In those parlous days for the Liberals it was considered a target seat. Experiencing continuing financial problems and at the nadir of his adult life he decided to seek employment in local government and abandon his political activities. The first I heard of him was when Pratap Chitnis, secretary of the Joseph Rowntree Reform Trust Ltd (JRRT), reported this news to the Trust’s directors who then sent £1000 to supplement his dole benefits so that he could retain his candidacy. Contrary to expectations Ashdown won the seat in 1983. As an MP, he initially forsook his military and espionage background and advocated unilateral nuclear disarmament for the UK, but he did not maintain this. He was an assiduous constituency MP, but while not a great Commons performer, he eventually succeeded David Steel as Liberal Leader in 1988. Ashdown was party leader at a critical moment – the rise of New Labour – in what could have been a huge moment of political reform. Very sensibly he sought a possible Lib/Lab collaboration with Tony Blair which would have led to a positive re-alignment of British party politics. The landslide Labour victory in 1997 put paid to the idea, and with it any chance of pushing electoral reform through parliament. Almost certainly, Tony Blair had been stringing him along as a precaution in case of a close result. The history of this period is embarrassing to the official Lib Dem history as well as to the Blair establishment and has never been properly registered. It was the Party’s real historic opportunity and Ashdown, supported by his consiglieri Richard Holmes, encouraged by Blair, were so committed to being part of the governing machine they failed to challenge it when, paradoxically, its very success made it vulnerable to others laying claim to the 'brand' of being radical yet unifying. It was an understandable, all-too-human but nonetheless fatal strategic error. The moment when New Labour was at its zenith was between the 1997 and 2001 general elections, when it pushed through its far-reaching changes to the constitution, such as the Human Rights Act, the Scottish and Welsh parliaments, the Good Friday agreement, the principle of the Freedom of Information and ridding the country of most hereditary peers. The great prize for the Lib Dems was to add proportional representation to the list. Blair seduced Ashdown into believing that a Commission headed by Roy Jenkins would deliver PR. But reform of this kind needs public energy to overcome established vested interests, not least Labour’s own. Ashdown could have challenged Blair to deliver on an overall new constitutional settlement and give lasting expression to the radicalism of that moment. Instead of expanding the reform agenda, however, so that PR became a defining issue for a full-scale popular democratic agenda, the Lib Dems allowed voting reform to become a technical discussion of how it might be achieved while retaining the constituency system. Blair was then able to suffocate it without difficulty and the prize was lost. While being physically very energetic and telegenically personable, Paddy Ashdown was not as good a party leader as some obituaries have suggested. The Liberals increased their number of MPs, but this had little to do with Ashdown’s leadership. He asked for the JRRT’s regular donation to be paid to Lib Dem HQ, but this was denied and instead the vast bulk of the money was given over to the Association of Liberal Councillors, regarded as a better conduit for promoting electoral success. Accordingly, Chris Rennard, the Party’s campaigns director, assiduously concentrated efforts on local activism that, particularly after Charles Kennedy became leader in 1999, increased the number of MPs to 63. This unprecedentedly high post World War Two figure was aided by Kennedy’s very overt opposition to the invasion of Saddam Hussein’s Iraq, which Ashdown foolishly supported. Undoubtedly, Ashdown’s greatest achievement came in the four years from 2002-06 when he served as the fourth International High Commissioner and EU Special Representative in Sarajevo during the Serbo-Croatian war. The situation played directly to his strengths as a very energetic tactician because the turmoil of daily events called for quick and immediate responses if damage was to be minimised or reversed. He was in his element for which he received much praise and recognition including an honorary doctorate from Ulster University (which I had proposed as former Vice-Chancellor). On returning to take up his position in the Lords, Ashdown’s subsequent participation in Liberal Democrat party activities proved disastrous in at least three respects. First, his intimate relationship with Nick Clegg. Ashdown became a very close adviser to the relatively inexperienced Lib Dem Leader and Deputy Prime Minister (not that Ashdown himself had any Cabinet experience). Although Ashdown would have preferred to work with Labour, he actively encouraged the formation of a Coalition with David Cameron. This was to prove an electoral disaster for the Lib Dems at the next General Election in 2015. Secondly, Clegg placed Ashdown in overall charge of campaigning for that Election. With much flourish he set up his “Wheelhouse” headquarters and paid out or withdrew central funds to the key constituencies based almost entirely on membership returns. This created uncertainty and confusion. The result was that his direction led to a net loss of 49 MPs, from 57 down to a mere eight. He was only successful as a campaigner in his own constituency of Yeovil. In 2012 I had publicly castigated the aimless Clegg as “a cork bobbing on the waves”. From the vantage point of his special position, Ashdown should have clearly recognised this and advised Clegg to withdraw from the Coalition but he, too, was overawed, albeit vicariously, by the trappings of Clegg’s office. Ashdown never possessed any ability to think through strategically; his strengths were as a tactician. This is not to say he was unaware of the need for longer-term strategic planning. He perceived such a need in 2017 when he published his Four Dangerous Ideas. They covered student fees and distance learning; owning one’s own personal data; internet-networked rather than constituency-based membership of political parties; and putting the emphasis on enhanced citizens rather than enhanced States. These somewhat disparate issues were hardly novel, but he neither developed them nor brought them together in any overall cohesive fashion precisely because in my view he lacked the broad intellectual philosophical capacity necessary. And this constituted his third major disaster. Similarly, when Nick Clegg decided to chase the money - which, to his great credit, Ashdown never did - and join the board of Facebook, Ashdown urged him to advance Liberal values. This was surely as forlorn a hope as Adam and Eve imploring their son Cain to be nice to his brother Abel! During much of his career, Ashdown had been a compulsive womaniser, earning him the sobriquet “Paddy Pantsdown” after the revelation of one of his affairs. Paddy was always convivial, could be relied upon to tell good jokes, and his work in the Balkans was an undoubted success. He was at his best when constrained by checks and balances, but unbridled and left to his own devices, he made many poor decisions.